After attending a full day of Singularly University classes and having my mind completely blown with new ideas, I decided to watch all of the SU videos online. Here is the first one I watched on Synthetic Biology with Andrew Hessel. I’ve actually heard Andrew speak before at TEDx Silicon Valley – which I helped start – but it was only for less than 10 minutes on a different subject. One of the big reasons why I love the Singularity University videos are all of the talks are 1 hour+ long. At 10 minutes its easy to get inspired by a message but at 1 hour its possible to get into the mind of each speaker and really see the full potential of each technology they work with. Andrews talk at SU was about Synthetic Biology for the absolutely beginner with no previous knowledge on the subject. On a very basic level synthetic biology is the ability to write DNA from scratch and create living organisms from that translated & synthesized DNA. It has huge moral, economic, and political implications and its becoming a reality faster than we realize. Synthetic biology got its name in 2003, so it’s very much a new and experimental field in the biology sciences. The big realization that Andrew had, which is the backbone of synthetic biology, is DNA is the programming language for cells that creates both the “software” and the “hardware” of living organisms. Luckily for us much of synthetic biology & biological systems can be paralleled from the IT sector and much of the same technology and thinking that went into building information technology we are using for synthetic biology. As the quote goes with all of this new technology, “We are standing on the shoulders of giants“, not needing to create everything from scratch. Technology is a form of forward engineering where we can build on top of the previous generations and go through evolutionary cycles much faster than nature can. It wasn’t that long ago, in 1870’s, that Darwin and the scientific community realized there were deep connections within species. Then in the 1950’s Watson and Crick discovered what this was and the form of DNA itself. It took another 10-15 years to figure out how this DNA was translated into amino acids. We began to be able to read this code in the 1970’s but the beginnings was very hard and cumbersome. In 1987 the first semi automated DNA machines started to appear and we got our next major breakthrough in 1998 with the first automated machines. After the creation of the automated DNA readers we saw a huge explosion in the number of base-pairs we were able to sequence and store. 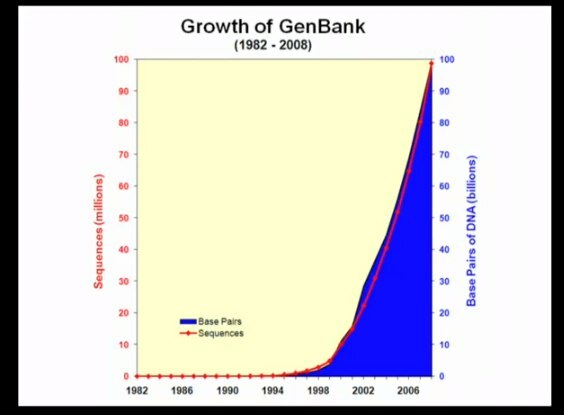 Below is a picture of GenBank, an open access database of all nucleotide sequences and their protein translations, and the explosion of data after the invention of the automated systems. We now have 100’s of billions of base-pairs just sitting there open to all, but next we need to be able to comprehend it. Andrews view on this next step is we need to be able to write genetic code ourselves. It’s one thing to read and interpret it but we will never have a full understanding of life if we can write our own genetic code from scratch. This is Andrew Hessel‘s mission. Right now today we can write genetic code through the old “cut and paste” method, just taking out strands of DNA and inserting them where we want. This was how we did genetic engineering since the 1970’s. But going forward with the invention of DNA printers were able to take code, send it to a machine, and get back a manufactured organism. Right now there are simple editors, starting to see a formation of a genetic programming language, and debugging via the editors. The dream is to be able to have a full editor to create designs in and literally at the push of a button have that design translated into sequenced DNA and put to work in living cells. We’re getting close to the point of not how to engineer a living organism but what should we engineer? There are programs like iGem, DIYbio, and huge companies like Amgen moving in this direction and the cost and time is falling dramatically due to economics. Andrew’s believe synthetic biology will be the next IT industry (in terms of explosion of growth) but will be even more important because it literally affects life as we know it on a large-scale. Once we get to the point where we can design, compile, execute, and create any form of life we want, it will change the world as we know it today. This has huge legal implications, moral questions, crime and terrorism issues, and much more that as a society we should be thinking about now rather than later. But as someone who is not involved in the biological industry at all, this is completely mind-blowing.